Kylie Jenner has built a foundation for her makeup empire but she is no stranger to fashion either. 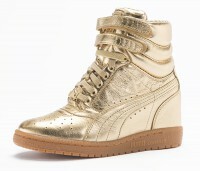 With her multi-million Puma contract the reality star has now a new product to promote and it is coming this April. Puma Fierce trainer is a sleek redesign of Rihanna’s Fenty trainer that is more gym activity-friendly….